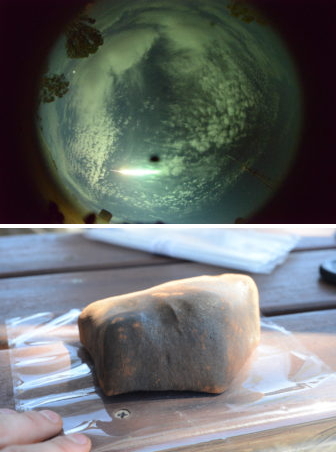 A 1.15kg meteor plummeted to the Earth near Morawa in West Australia in late October, spotted by members of Curtin University's Desert Fireball Network (DFN). Before it fell through the atmosphere, the meteorite would have been 50-100 times larger than when it landed. The fireball was tracked and pinpointed by four skyward-pointing outback cameras combined with users’ data from the Fireballs in the Sky citizen science app. The combined approach allowed experts to calculate the meteorite’s landing to about 200 metres from where it was subsequently found. DFN founder Phil Bland says finding it so quickly meant it was in good condition and scientifically valuable. “It [the meteorite] is a type called a chondrite, which is a type of meteorite which has not been cooked up enough to melt,” Professor Bland told ABC reporters. “We're hopeful, because we managed to get it in a very pristine way, that we can find some quite soluble elements or minerals in there, or volatile minerals that can tell us about water and organics in the solar system.